Hello November. Hello time change that makes no sense if you have kids or pets. Hello wool sweaters & knit hats, jackets & mittens. Hello baked goods, life-affirming soups, afternoon tea, a bigger mug of coffee in the mornings. Hello candlelight, good books, reflection time, more yoga, new daily rhythms. 5:30-6:00 am Easton wakes up. We spend a few minutes cuddling & he happily babbles (telling me his dreams?) and I tell him what we will do this day while changing his diaper & making the bed & starting laundry. Every day is laundry day. 6:30-7:45 We make coffee together. Then I get Daddy’s breakfast and lunch packed & listen to the news while Easton plays. 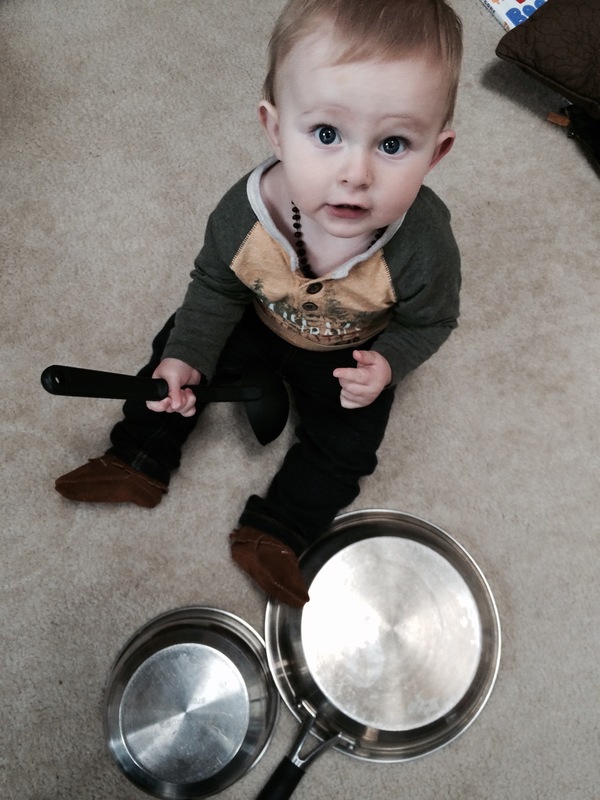 I try to give him new “toys” during this time to explore–pots and pans, tissue paper, a bin filled with rotini noodles, water in cups, bottles filled with different grains, leaves, turkey basters & rolling pins, etc. It keeps him occupied in the living room–and we have a window in the kitchen so that I can watch him play while I clean up the kitchen and pack lunches. Aaron leaves for work around 7:00, so we always kiss & wave goodbye. 7:45-8:00 Get dressed & make breakfast (together). 8:00-8:30 Breakfast. We almost always listen to oldies while we eat, and almost always dance after breakfast a little while. 8:45-9:30 Morning nap begins. It’s a little different everyday, and Fridays I go to a book club, so naps a later then. His morning nap lasts anywhere between 30 minutes to an hour. I usually try to use this time to get daily chores done that Easton can’t help with (cleaning bathrooms or kitchen) and then sneak in a few minutes of yoga. 10:00 We get ready to go outside for a run & play time in the park. Monday-Thursday I run 2-4 miles depending on how restless I feel Easton getting while we’re out. 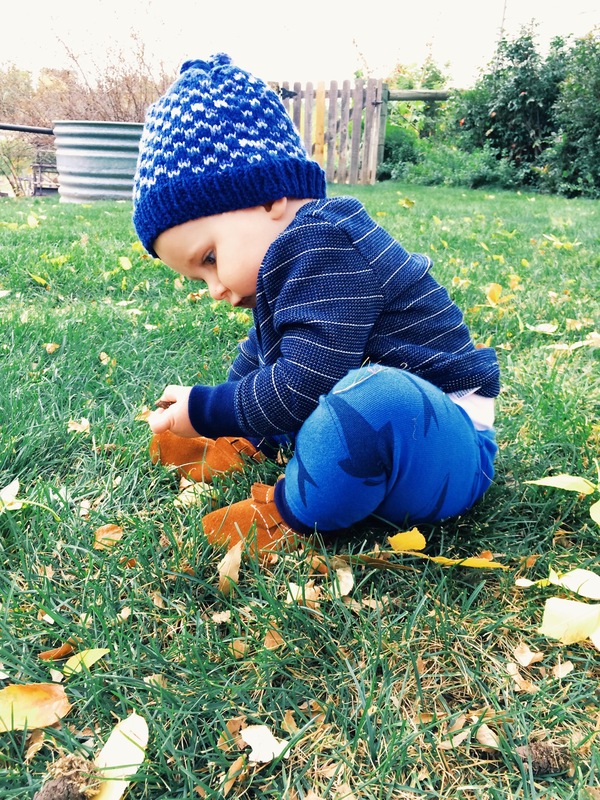 We stop by the park on our way home to let him explore–grass, leaves, rocks, sand. While he explores the great outdoors, I try to get a little work-out in. Planks, burpees, core work, squats, lunges, tricep dips, and whatever else I can think of. 11:30-12:ish We are home. I nurse him and then shower. As non-crunchy as it is–he’s either in the pack and play in the hall or the Baby Einstein Jumper in the bathroom with me while I take 5 minutes to shower (often while playing peak-a-boo). 12:30-1:ish We prepare lunch together and eat. He eats small bits of whatever I have usually. Beans and avocado, broccoli & brown rice, squash and pear, etc. 1:ish-2:ish Afternoon chores–folding laundry, dusting, watering plants, etc. I usually wear him–it helps to calm him & focus. Then we have story time. We read the same 5 books about everyday, and a couple new ones. 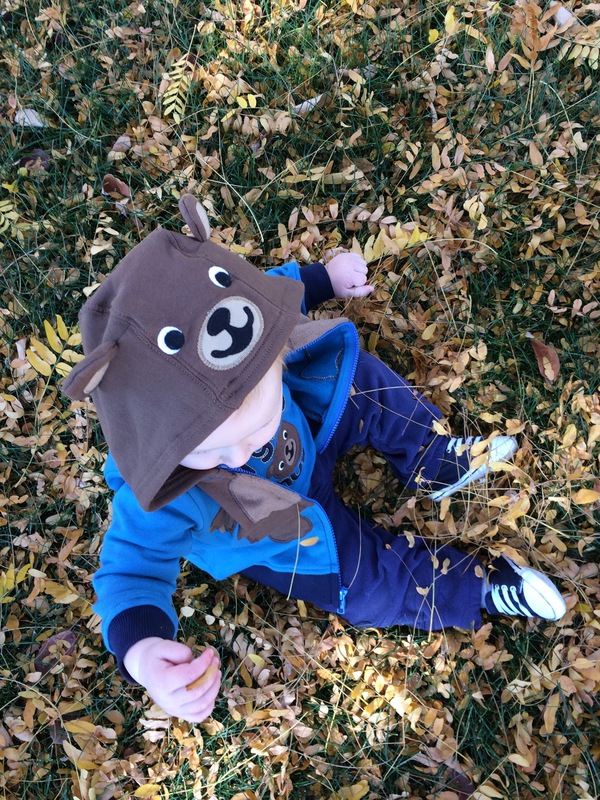 Lately, in our rotation is Little Blue Truck, Brown Bear Brown Bear, The Busy Squirrel, In My Tree, and Too Much Noise. I try to include some seasonally appropriate books so that the scenery models what we see outside & what is in his daily life. 2:ish Afternoon nap time. Most afternoons he’ll nap an hour and a half to two hours. I use this time to blog, write, knit or crochet, and now work on my holistic health counseling website and marketing! I’d also like to schedule clients during this time in the future. Often, I also use this time for dinner prep-work that I can’t do while wearing Easton. 5:30-6:30 We come home and he plays or helps me get dinner started. We also use this time to tidy up a little bit. 6:30ish-7:ish We sit down to dinner. Aaron gets home around 6ish most nights, some nights later. We try to eat as a family when we can. 7:30 Bath time or play time. It depends on how dirty Easton gets during dinner and throughout the day. He’s still not always a huge fan of them, so everyday baths are not fun to battle. 8:ishhhh. Somewhere between 8 & 9 Easton will go to bed. We do have a bedtime routine, but he doesn’t always go right to sleep. Most nights I still nurse him to sleep despite what all the sleep experts say. 8:30ish-10:00 I run around the house picking things up, responding to emails, making the next day’s to-do list, read or watch mindless tv if it’s been one of those days. I also use this time for self care–whether it be a few restorative yoga poses, meditation, pranayama, prayer, self-massage, journaling, skincare rituals, a cup of tulsi tea, etc. As the months grow colder, I will need more and more self-care when I’m not outside as much and there isn’t as much light. This time of year can be challenging for me mentally and emotionally, so if you are like me, follow along because I’ll be sharing more about health and self-care in the coming weeks! What does your daily rhythm look like? How has it changed with the time and season change? Do you struggle to add self-care into your day, or need more of it in the winter months? 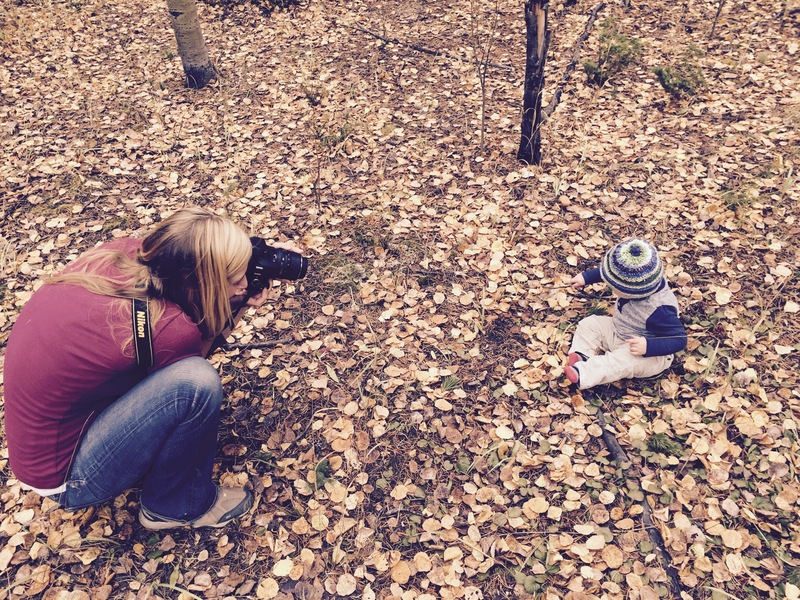 Sweet pics! Thank you for sharing your day! I like to see how other stay at home moms spend their days and even though it can sometimes be annoying sticking to a schedule, it definitely makes life with a baby/toddler a lot easier! I love this, Keri. Rhythm is a such a perfect word. The weather and time change has been difficult for me. It dropped like 20 degrees here this week and is now in the 20’s in the morning. I feel bad running with my boy when it is so cold. Do you keep running during the winter? I’d love to here what you do. I’ve been feeling sluggish since I haven’t been getting the outside time as much.